Design nightmare: just how smart is Alien Isolation's monster? I can hear it out there in the clanking, dimly lit corridors of Sevastopol. It's scuttling through the vents just above me as I lie prone under a gurney in the Medical Ward. I dare not use my motion sensor – it's close enough to hear me. I prick up my ears and try to listen for any change in its direction – any movement that'll give me a clue as to what I should do next. The atmosphere is nail-shreddingly tense, compounded by the fact that I have no idea what it's going to do next. The Alien is completely unpredictable. That's what makes it terrifying. Alien: Isolation is a breed apart from a lot of what's available in the horror genre of gaming. While franchises like Dead Space, Resident Evil and F.E.A.R. have moved their in-game experience ever closer to run-and-gun affairs, Alien: Isolation speaks to a far more old school survival horror aesthetic. Ironically, for a series that has been bolted into a shooter framework almost since day one, Alien Isolation has ditched empowering players and opted instead to make them feel as vulnerable as possible. Instead of relying on jack-in-the-box scares or shocking set pieces – although Alien: Isolation contains its fair share of those - developer Creative Assembly built an AI for the xenomorph that listens out for any noise the player makes and then instantly makes a bee-line for them. Furthermore, players can't kill the Alien, so their choices are basically run, hide or die. 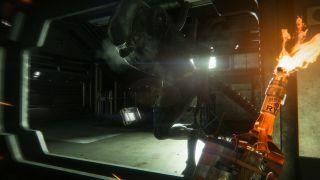 According to Alien: Isolation's Creative Director, Alistair Hope, the aim from the beginning was to use the random nature of the Alien's movements to keep players on the backfoot and restore some of the creature's menace to gaming. While the approach of stripping the player of the ability to fight back against a monster has been done before – in games like Amnesia: The Dark Descent and more recently OutLast – Alien: Isolation banks a lot of its appeal on making its centerpiece creature feel as fresh as it did when it first graced the silverscreen. "What we were trying to achieve was the same sort of terror audiences experienced when the watched the first film," says Hope. "Unlike the movie, which is scripted, in our game the player can come across the Alien at any point and at any time – and we had to cater for that." "One of the things were thinking early on was that we wanted to re-Alien the Alien – make it genuinely scary again and we realised that that experience was one we wouldn't be able to choreograph or script in any way." "We wanted to restore some of the mystery of the creature – that sense of not knowing – and we realised that if we created an Alien that used its senses to track you, that would restore some of its unpredictability. You wouldn't know moment to moment what it was going to do." To a degree, Hope says that the team at Creative Assembly was operating without a safety net. "It was very much a cross discipline effort," he says. "We'd never created something like this before." "The first challenge was the Alien's size – it's enormous – and we very much wanted it looking down on the player. Yet, the world is built for humans in scale, so the creature needs to be able to navigate believably through the world." Since the Alien is the core of the game's experience, every system and every mechanic in the game has to support it. But dropping a roaming, unpredictable AI into the middle of an environment had the potential to play havoc with the game's level design.